One of the major difficulties in understanding how neural networks work is due to the backpropagation algorithm. There are endless texts and online guides on backpropagation, but most are useless. I read several explanations of backpropagation when I learned about it from 2013 to 2014, but I never felt like I really understood it until I took/TA-ed the Deep Neural Networks class at Berkeley, based on the excellent Stanford CS 231n course. The course notes from CS 231n include a tutorial on how to compute gradients for local nodes in computational graphs, which I think is key to understanding backpropagation. However, the notes are mostly for the one-dimensional case, and their main advice for extending gradient computation to the vector or matrix case is to keep track of dimensions. That’s perfectly fine, and in fact that was how I managed to get through the second CS 231n assignment. For some of the harder gradient computations, I had to test several different ideas before passing the gradient checker, and sometimes I wasn’t even sure why my code worked! Thus, the purpose of this post is to make sure I deeply understand how gradient computation works. Note: I’ve had this post in draft stage for a long time. However, I just found out that the notes from CS 231n have been updated with a guide from Erik Learned-Miller on taking matrix/vector derivatives. That’s worth checking out, but fortunately, the content I provide here is mostly distinct from his material. There’s a lot of notation that can get confusing, so for simplicity, I always denoted inputs as and outputs as , though in this example, we only have one output at each step. By doing this, I can view the s as a function of the terms, so the local gradient turns into and then I can substitute in terms of the inputs. 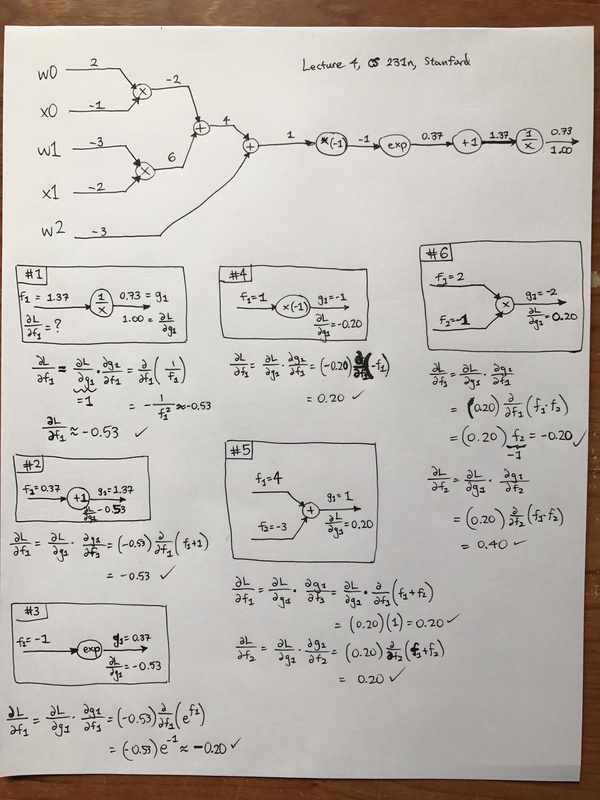 When doing backpropgation, I analyzed it node-by-node, and the boxes I drew in my image contain a number which indicates the order I evaluated them. (I skipped a few repeat blocks just as the lecture did.) Note that when filling in my boxes, I only used the node and any incoming/outgoing arrows. Also, the and keep getting repeated, i.e. the next step will have equal to whatever the was in the previous block. Always remember that when we have arrows here, the part above the arrow contains the value of (respectively, ) and below the arrow we have (respectively ). Hopefully this will be helpful to beginners using computational graphs. Now let’s get to the big guns — vectors/matrices/tensors. Vectors are a special case of matrices, which are a special case of tensors, the most generalized -dimensional array. For this section, I will continue using the “partial derivative” notation to represent any derivative form (scalar, vector, or matrix). Our first example will be with ReLUs, because that was covered a bit in the CS 231n lecture. Let’s suppose , a 3-D column vector representing some data from a hidden layer deep into the network. The ReLU operation’s forward pass is extremely simple: , which can be vectorized using np.max. The most interesting part of this happens when we expand the Jacobian and see that we have a bunch of derivatives, but they all evaluate to zero on the off-diagonal. After all, the effect (i.e. derivative) of will be zero for the function . The diagonal term is only slightly more complicated: an indicator function (which evaluates to either 0 or 1) depending on the outcome of the ReLU. This means we have to cache the result of the forward pass, which easy to do in the CS 231n assignments. This is as simple as doing mask * y_grad where mask is a numpy array with 0s and 1s depending on the value of the indicator functions, and y_grad is the upstream derivative/gradient. In other words, we can completely bypass the Jacobian computation in our Python code! Another option is to use y_grad[x <= 0] = 0, where x is the data that was passed in the forward pass (just before ReLU was applied). In numpy, this will set all indices to which the condition x <= 0 is true to have zero value, precisely clearing out the gradients where we need it cleared. In practice, we tend to use mini-batches of data, so instead of a single , we have a matrix with columns.1 Denote the th column as . Writing out the full Jacobian is too cumbersome in this case, but to visualize it, think of having and then stacking the two samples into a six-dimensional vector. Do the same for the output . The Jacobian turns out to again be a diagonal matrix, particularly because the derivative of on the output is zero for . Thus, we can again use a simple masking, element-wise multiply on the upstream gradient to compute the local gradient of w.r.t. . In our code we don’t have to do any “stacking/destacking”; we can actually use the exact same code mask * y_grad with both of these being 2-D numpy arrays (i.e. matrices) rather than 1-D numpy arrays. The case is similar for larger minibatch sizes using samples. Remark: this process of computing derivatives will be similar to other activation functions because they are elementwise operations. That’s pretty nice — all we need to do is copy the upstream derivative. No additional work necessary! Remark: crucially, notice that the elements of are repeated across columns. but the problem is that this isn’t matrix multiplication. Here, is a function from to , and to evaluate the derivative, it seems like we would need a 3-D matrix for full generality. See what happened? This immediately reduced to the same case we had earlier, with a Jacobian being multiplied by a upstream derivative. All of the Jacobians turn out to be the identity, meaning that the final derivative is the sum of the columns of the original upstream derivative matrix . As a sanity check, this is a -dimensional vector, as desired. In numpy, one can do this with something similar to np.sum(Y_grad), though you’ll probably need the axis argument to make sure the sum is across the appropriate dimension. Going from biases, which are represented by vectors, to weights, which are represented by matrices, brings some extra difficulty due to that extra dimension. Let’s focus on the case with one sample . For the derivative with respect to , we can ignore since the multivariate chain rule states that the expression differentiated with respect to causes to disappear, just like in the scalar case. The harder part is dealing with the chain rule for the expression, because we can’t write the expression “”. The function is a vector, and the variable we’re differentiating here is a matrix. Thus, we’d again need a 3-D like matrix to contain the derivatives. We fortunately see that it simplifies to a simple matrix product! This seems to suggest the following rule: try to simplify any expressions to straightforward Jacobians, gradients, or scalar derivatives, and sum over as needed. Above, splitting the components of allowed us to utilize the derivative since is now a real-valued function, thus enabling straightforward gradient derivations. It also meant the upstream derivative could be analyzed component-by-component, making our lives easier. A similar case holds for when we have multiple columns in . We would have another sum above, over the columns, but fortunately this can be re-written as matrix multiplication. How do we compute the convolutional layer gradients? That’s pretty complicated so I’ll leave that as an exercise for the reader. For now.